I visit many design forums daily, which is great source of information, inspiration and community. It's an opportunity to market yourself by showcasing your know how and expertise in the field of design. Many award winning designers and potential clients frequent these forums often. You start to build a virtual friendship and trust among all the members. These relationships can lead to real world projects. You are not bound by borders anymore with this thing called the internet. For me, forums have become like a second family, even though I have never met most of the members. The ones that I have met personally are great, I am happy to call them my friends. Forum members are very supportive, helpful and a loyal bunch. You mess with one member, you mess with us all. On the How Design Forum we picked names for our Secret Santa Gift Exchange. I was feeling like a litte kid again, exicited about what I will be getting and when I will be getting it. This is what I mean about community and family. 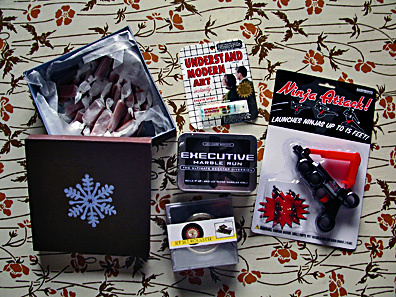 This morning a bunch of fun goodies arrived at my door step from my Secret Santa. • Executive Marble Run - Erector set with marbles. • Jet Set Roulette - Mini roulette game. • Ninja Attack - Ninja flying toy. Thanks for the link. People arrive here from it every day, it seems. Take care. Have a great weekend. That ninja toy is pretty fine, btw. Be sure to only use it for good. hey i'm a link on your connections! sweet!